Long curtains can puddle elegantly on the floor or hang sloppily like overly long pants, depending on the fabric and the amount of excess. Sometimes, a radiator, headboard, window seat or counter affects how long your curtains can hang. Explore creative ways to change the length that your curtains hang from the floor, often without having to drag out the sewing machine. The position of the tiebacks can give long curtains a little lift. By mounting one to the wall behind each panel, instead of beside them, you can pull up the drapery fabric all around it. Blouse it neatly, shortening the curtain length and creating an elegant look. An option for fixed panels is to drape clear monofilament or twine over the rod, centered directly above each panel, dangling the ends to tieback height or higher or lower, as needed. Wrap one end around the panel, hoist the fabric to the desired height and tie the string ends together to secure the look. Shorten tab-top or tie-style curtains at least a few inches by turning them into grommet-hung curtains. Cut off the tabs or ties. 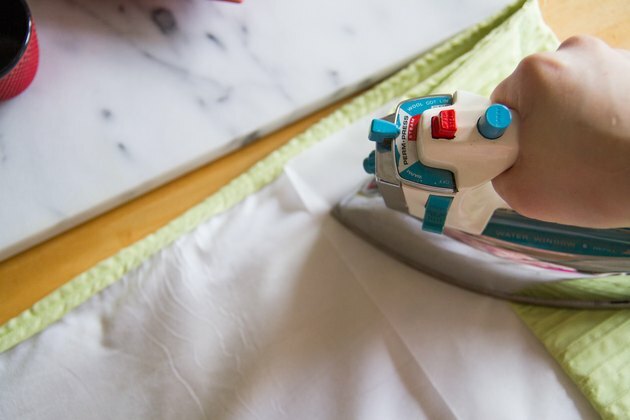 Stiffen the back header area by ironing fusible header or grommet web or tape along the top, or fold and hem them as much as necessary, using fusible thread or fabric adhesive for no-sew simplicity. Adhesive products can damage or stain some fabrics, such as sheer or silk materials; alter these with needle and thread, or look for lightweight fusible web products, and refer to label for recommendations and guidance. Grommets not only offer a contemporary look, but also snap around evenly spaced holes -- no sewing required. Shorten ring-hung or tab-style curtains by turning them into pleated drapery, using pleating tape to decrease sewing time. Alternatively, bring up excess material using decorative clips or buttons along the header. 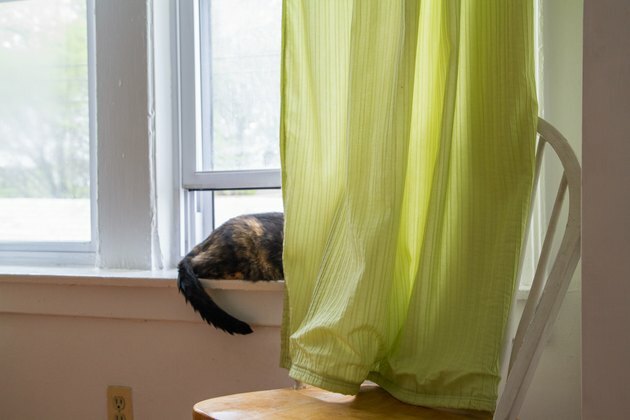 Turning long, lightweight window treatments into window scarves -- or simply lifting the hems up and draping them over the rod -- is another relatively quick, creative way to deal with excessive length. 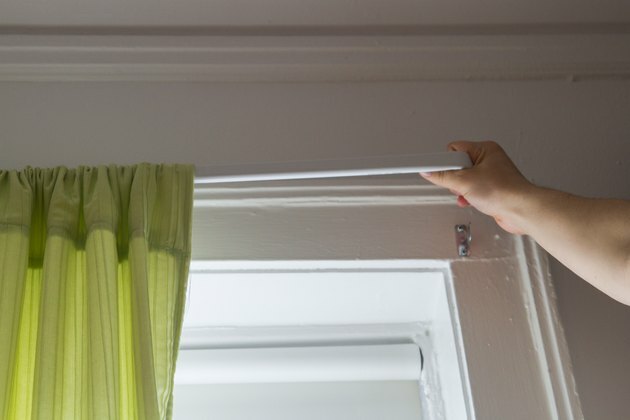 Making curtains shorter can be as easy as raising the rod, if wall space allows. While preparing to do this, contemplate extending the rod width-wise, so that stacked back fabric exposes all the glass -- if it doesn't already -- maximizing natural light and the view. Use the rod-raising method also to lift a window topper. The topper's hem should just hide the upper frame, baring every inch of the window below. 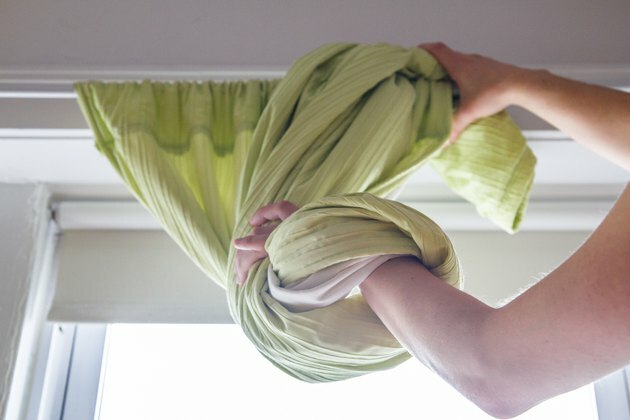 Fusible tape and an iron or fabric adhesive are handy needle-and-thread alternatives for making curtain tiers, as long as the material is heavy enough to hide glue marks or hold up to the iron's heat. Tuck or evenly fold the material horizontally, every foot or so, in tape-width sections to bring the fabric up a little. To shorten excessive length and create shabby-chic style, gather and form poufs from header to hemline. Another option is to take the hem up onto the front of its panel, holding it in place with decorative buttons, for an almost reversed-pouf look.